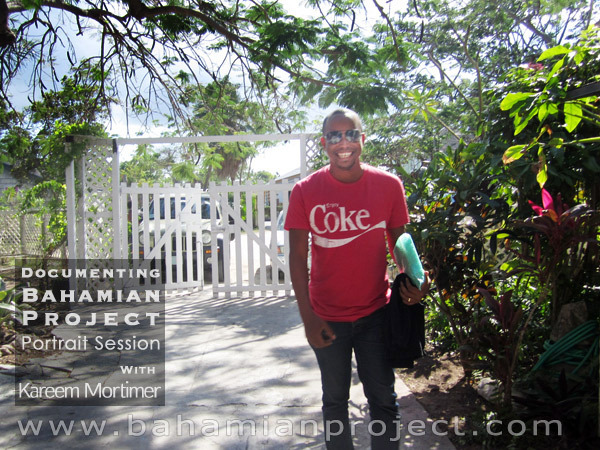 This picture of Kareem Mortimer was taken right after his portrait session for the Bahamian Project. The final portrait images will be unveiled at the Exhibition Opening at the National Art Gallery of The Bahamas on July 11, 2013. Kareem got started writing and co-producing the 1998 Bahamas Games documentary. He has written and directed several films since then – narratives, documentaries, shorts, feature-lengths – some of which received international distribution, recognition, and awards. The Eleutheran Adventure – a film he produced and directed – won the 2006 Audience Award for Best Documentary at the Bahamas International Film Festival. His short narrative film Float won five international awards and was distributed in North America, Germany, and Austria. He says one thing he learned through his documentary work is that everyone has an interesting story and if you stick around long enough you can uncover that story. In both his feature and documentary films Mortimer has dealt with strong issues such as homosexuality, discrimination and racism. His debut feature Children of God (2010) is the first narrative feature from the Caribbean that focused on homosexual themes. Another project Wind Jammers (2010) which he co-directed with Richard von Maur is a children’s film that deals with racism. Children of God won 18 awards, was distributed in 24 territories, and had theatrical releases in the US, Netherlands and UK. BET named it one of the Top Ten Movies Of The Year. 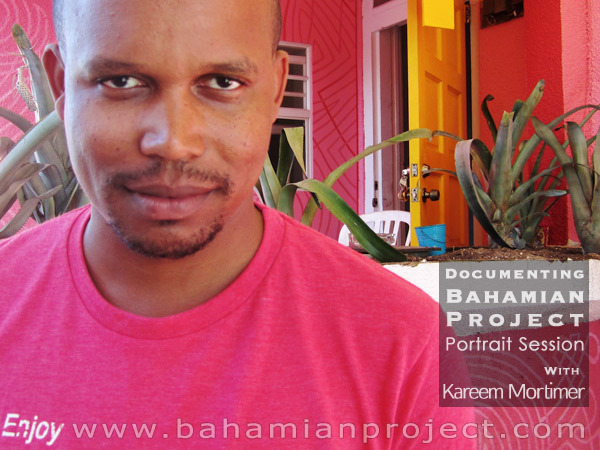 This picture of Kareem Mortimer was taken as he was arriving for his portrait session for the Bahamian Project. The final portrait images will be unveiled at the Exhibition Opening at the National Art Gallery of The Bahamas on July 11, 2013. I am so proud of Kareem! Even prouder that we are both alums of TCS. I still remember watching HBO in Baltimore, MD and seeing Kareem's movie come on TV. I started screaming and shocked everyone in the room with me. I could not stop bragging about my former classmate and how proud I was of his accomplishments. Thanks for capturing our country and so many other great things on film.